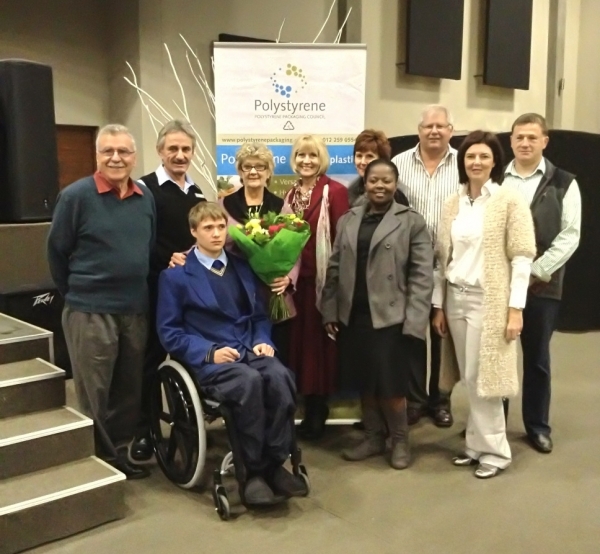 A 16 year old hero from Brits in the North West Province who was paralyzed on Old Year’s Eve when he tried to protect his friend during an attempted robbery, has become the latest recipient of a wheelchair thanks to the Breadtags for Wheelchairs Project administered by the Polystyrene Packaging Council (PSPC). A brave act by Luday van der Merwe changed his life forever when he jumped in front of a bullet meant for his friend, Deidre Strydom (19), on the 31st of December. “There was a festive atmosphere in our neighbourhood with people shooting of fireworks all around us to welcome in the New Year”, Luday says, remembering the night of the incident. “We were worried about the effect of the loud noise on the animals and wanted to check if they were alright”. However, on their way they were confronted by three armed robbers who fired one shot in the air and aimed another gun at Deidre’s head. Luday bravely tried to push the gun away from Deidre when the shot went off, taking a bullet that punctured his lungs and got lodged in his spine. Hearing about the heroic and selfless incident that left one of their school friends paralysed from the chest down, the local communities of Hartebeespoort Dam and Brits started collecting breadtags made from high impact polystyrene in order to purchase a much needed wheelchair for Luday. “Over 3 000 kilograms of breadtags were collected in less than 12 months,” explains Adri Spangenberg of the PSPC. This was more than enough bread closures to purchase a state of the art, custom-made wheelchair which was recommended for Luday’s specific needs by CE Mobility. This chair was handed over during a special ceremony held at the Doxa Deo School in Hartebeespoort Dam recently. Representatives of Groplast and MFI Mouldings – two of the companies that pay for these breadtags in order to recycle them into seedling trays, cornices, skirtings, outdoor furniture, coat hangers, poles and decking – were present at the handover, along with community leaders and the Deaf TV who filmed the handover. “I am very grateful to everybody who worked together to collect the breadtags for my wheelchair”, Luday says. “A special chair such as the one that they bought for me makes it easier for me to continue with my rehabilitation programme and learning how to cope with my disability. I am grateful that a something good and positive could come out of this tragedy”. For more information about the Breadtags for Wheelchairs programme, click here.